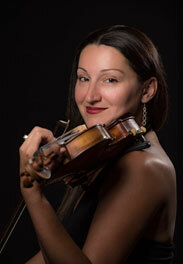 Kimberly Tichenor started the violin at age three in her native New York. Her primary and most influential teacher was Young-Sook Han. At the age of thirteen she began studying with Margaret Pardee of the Juilliard School and a year later entered into Juilliard's pre-college program. She attended Indiana University where her major teachers were Josef Gingold, Yuval Yaron, Franco Gulli and Henryk Kowalski. She was the recipient of the Dorothy Richard Starling Foundation Scholarship. She joined the Louisville Orchestra's second violin section in 2000 and has acted as the Assistant Principal second violinist since 2010. She has served on the Louisville Orchestra's musicians' committee for most of her years in the LO and it has been a great honor to represent the musicians of the Louisville Orchestra. In her spare time she enjoys spending time with her family, practicing Bikram yoga, cooking and entertaining with friends.